At the end of this newsletter, I promote my Visual Algebra summer workshops for teachers of grades 6-9. This summer's offering is a little different from past years: it is more affordable, and you get a choice of different dates and locations. Also, my workshop is part of a broader program: while you attend my workshop, a colleague of yours can learn about "Math for Joy" in grades 2-5, or how to use the Desmos Activity Builder, or how to integrate projects into math education. Scroll down, and click on the links to the host schools for more information. Here are links to posts on my Math Education Blog that you might find interesting. If you are so moved, you may comment on the posts, and/or subscribe to the blog. In the last issue of this newsletter I mentioned learning about story tables, a powerful tool to teach about functions in high school. In the blog post I referenced, I speculated that the tool could be used in middle school, and in the exploration of equation solving strategies. Well, that turned out to be a good idea, which I followed up with Shira Helft, the story tables pioneer. Read the discussion I had with her about how that would work in a particular example: Story Tables in Middle School. Every Minute Counts is a book by David R. Johnson which had a big influence on me as a beginning teacher. After mentioning that on Twitter, I learned that I was not the only one: he influenced many other math educators of my generation. His best insights are on how to run a class discussion in a way that on the one hand engages all students, and on the other hand provides the teacher with a lot of information about what students do and do not understand. (What we now call formative assessment.) I review the book here. The only new addition to my site since the last issue of this newsletter is Connect the Dots, a worksheet with many interesting "enrichment" lattice puzzles and problems. I put this collection together for meetings of Mathematics Teacher Circles, but much of it can be used in the classroom or in math clubs. The geoboard has been a recurrent topic both on my Web site, and on my blog. That is because it provides a nicely constrained environment for mathematical exploration, and lends itself to many activities where students can discover or apply important ideas in the K-12 curriculum. My Geoboard Home Page offers a hopefully comprehensive list of links to my writings on this topic. Geoboards and other manipulatives do not accomplish miracles, but they do provide opportunities for collaboration, discussion, and reflection in the classroom. They can help shift the center of gravity towards the students, offer visual representations of concepts that complement and support traditional approaches and technological tools, and help teachers get insights into student understanding. If you're interested in using manipulatives in secondary school, you can get many ideas by clicking on the links I share on my Manipulatives Home Page. One geoboard lesson I pioneered in the early 1990's ("Tilted Squares") is now available in various versions on the Web and in various curricula. It is part of a sequence in Geometry Labs (8.4 to 9.4 — free download), and it leads (among other things) to the Pythagorean theorem. Given the importance of this theorem, I suggest some other approaches to complement this one, on my Pythagorean theorem home page. I especially like this grid paper activity, which can precede this online puzzle. 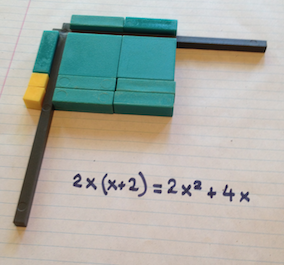 This summer, I will offer a grades 6-9 version of my Visual Algebra workshop. In this three-day workshop, I will present a wealth of visual approaches to pre-algebra and algebra, including: Lab Gear manipulatives for basic symbol manipulation, geoboard lattices for slope, a powerful parallel axes representation for linear functions, and intelligent use of technology. Participants will learn techniques that will allow them to serve the whole range of students better by offering: greater access, because of using multiple representations; greater challenge, because of expecting multidimensional understanding; and greater variety, because of using manipulative and electronic tools. Other questions? Check out my Web site, or reply to this e-mail. To subscribe to this newsletter, or to read past issues, click here.